George Hotz (aka geohot), the kid who was the first to unlock the original iPhone back in 2007 and then iPhone 3GS in July of this year is back! This time he is the first one to release jailbreaking solution for the new iPhone 3.1.2 Firmware for all devices through his new tool called blackra1n. blackra1n is a software tool which can jailbreak (not unlock) all iPhone’s (iPhone (Edge), iPhone 3G and iPhone 3GS) and iPod touch’s (iPod touch 2G and 3G) running on firmware version 3.1.2. blackra1n is currently for Windows only, a Mac version of this app can be expected soon. UPDATE: An updated version of this guide for blackra1n RC3 with blacksn0w can be found here. So, what is blackra1n? blackra1n is a 30 second ALL device 3.1.2 jailbreak. Even the ipt3, but the ipt3 is tethered. In order to boot it, just rerun blackra1n. Note for iPhone 3G and 3GS: Do NOT upgrade to iPhone 3.1.2 with blackra1n if you want to keep your unlock as doing so will result in upgrade of your baseband which will make it almost impossible for you to unlock. Step 1: Download and install the latest version of iTunes (download link given below). Step 2: You will now need to first update/restore to the original iPhone OS firmware 3.1.2 on your iPhone by using the latest version of iTunes. Download link for iPhone Firmware 3.1.2 is given at the end of the post. Step 3: Download blackra1n for Windows (download link at the end of the post). Step 4: Start blackra1n app. If you are on Windows 7 or Vista, run the app with “Windows XP Compatibility” mode by enabling it from the “Properties” tab to avoid any errors during the jailbreak process. Step 6: Let the app do its thing and wait for the phone to automatically reboot. Step 7: You should now have “blackra1n” in the list of applications on your iPhone. 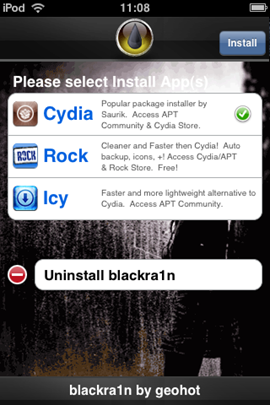 Run “blackra1n”, download Cydia and let it install it. Step 8: Finally reboot your iPhone. Voila! You should now have fully jailbroken iPhone or iPod touch running on firmware 3.1.2. UPDATE 1: PwnageTool 3.1.4 has been released which can Jailbreak iPhone on 3.1.2 while keeping its baseband intact to 04.26.08. Complete step-by-step jailbreaking guide for Mac OS X can be found here and for Windows here. Unlocking guide for iPhone 3G and 3GS on 3.1.2 firmware can be found here. UPDATE 2: blackra1n is now available for Mac OS X as well. Download link plus complete step-by-step instructions guide on how to jailbreak iPhone/iPod touch using blackra1n on Mac OS X can be found here. UPDATE 3: Follow the step-by-step guide posted here to fix missing carrier name or logo on your unlocked and jailbroken iPhone 3G/3GS running firmware 3.1.2. UPDATE 4: Follow the step-by-step guide posted here to Enable Tethering on iPhone 3.1.2 Firmware. UPDATE 5: You may also like to check out How to: Patch MobileInstallation File on iPhone 3.1.2 Firmware. 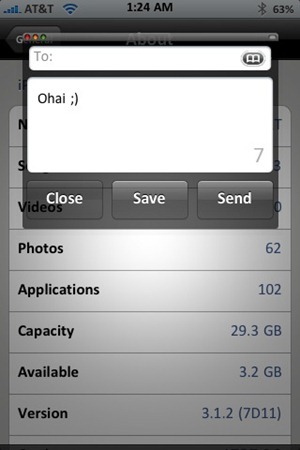 UPDATE 6: Native MMS functionality in Messages app on iPhone 2G can now be enabled using the step by step guide posted here. UPDATE 7: Fix Push Notifications on Hacktivated iPhone 2G/3G/3GS running iPhone firmware 3.1.2 can be found here. UPDATE 8: blackra1n RC2 is Live. Click here for more details. UPDATE 9: blackra1n RC3 with blacksn0w is now available. Follow the complete step-by-step guide here to jailbreak, and here to unlock iPhone 3.1.2 firmware with 05.11.07 baseband. UPDATE 10: An alternate tool called sn0wbreeze has been released for jailbreaking iPhone and iPod touch. Follow the complete step-by-step guide posted here to jailbreak iPhone 3.1.2 firmware using sn0wbreeze. UPDATE 11: Redsn0w 0.9 for Windows and Mac is LIVE! Follow the complete step-by-step guide posted here to jailbreak iPhone 3.1.2 firmware using Redsn0w 0.9. UPDATE 12: iPhone 3.1.3 firmware has been released and can be downloaded from here. iPhone 2G and iPod touch 1G/2G(older models) can be jailbroken and unlocked(iPhone 2G only) on the latest iPhone 3.1.3 firmware. Follow the step by step guide posted here or here to jailbreak/unlock iPhone 2G, and here for iPod touch 1G/2G on 3.1.3 firmware. UPDATE 13: Redsn0w 0.9.4 is LIVE! Download links and jailbreaking instructions can be found here. UPDATE 14: Sn0wbreeze 3.1.3 -V1.3 is LIVE! Follow the guide posted here to jailbreak iPhone 2G, 3G and iPhone 3GS (older bootrom only) on iPhone 3.1.3 firmware. iPhone 3G and 3GS can then be unlocked using ultrasn0w or blacksn0w. iPhone 2G can be unlocked using the guide posted here. UPDATE 15: PwnageTool 3.1.5 for Mac OS X is now LIVE! Follow our complete step by step guide posted here to jailbreak and unlock iPhone 2G, 3G, 3GS and iPod touch 1G, 2G on iPhone OS 3.1.3. UPDATE 16: Is GreenPois0n going to Jailbreak iPhone 3.2 and iPad Untethered? More info here. UPDATE 17: Geohot has a working solution for iPhone 3.1.3 / 3.2 on the new baseband and bootrom. Here is a video of it in action. UPDATE 18: Jailbreak iPad with Spirit is Real ! More info here. UPDATE 19: Jailbreak iPad with Blackra1n is confirmed by Geohot! More info here. UPDATE 20: Spirit Jailbreak tool has been Released. You can jailbreak all iDevices including iPhone 3G/3GS, iPod touch 2G/3G and iPad on OS 3.2. iPhone unlockers should stay away! well i was having the same problem as queenie,i did what u suggest and it work easily,thanks guys it was really helpfull your website,im from mexico and i was surfing all over till i find u,thanks again for the post and the links,hasta la vista!!! I own an ipod 3rd gen with 4.0 software. I downloaded blackra1n and installed it in my common files folder. When the app says, “done, wait for reboot”, my ipod doesnt reboot. does anyone know why? Yes, because you are an idiot! Blackra1n DOES NOT WORK WITH iOS 4!!! I will tell my friends about you! how can you tell when it has been jailbreaked? i mean i tried downloading an app and it still took my money? i downloaded blackra1n and when tried to open , this message from windows came up ASL.dll file is missing try and reinstall program. please help. hi.. i got a iphone 3g already unlocked and running on version 3.1.2. now my problem is that i recently installed PUSH DOC from cydia coz my push notifications and youtube was not working. Push Doctor sorted these problems out BUT my battery started draining quickly.. now i am thinking of restoring it as in washing the whole iphone system so that it can be back to its state.. PLASE ADVICE ME WHAT TO DO.. IS RESTORING THE BEST OPTION.. IF SO KINDLY HELP ME THROUGH IT.. i want to keep on using the same firmware 3.1.2. RedSnOw jailbreaks ios 4.0.2. Please inform the world. I understand a site that’s still able to ՍΝᏞΟᏟΚing AT&T phones after AT&T denied the access of numerous ՍΝᏞΟᏟΚing sites for their database after the renew, which caused numerous սոⅼοсkings no longer working anymore. The site is just google atttiphoneuunlocking, it’s without doubt one of many fastest սոⅼοсking site you can find on the web nowadays.